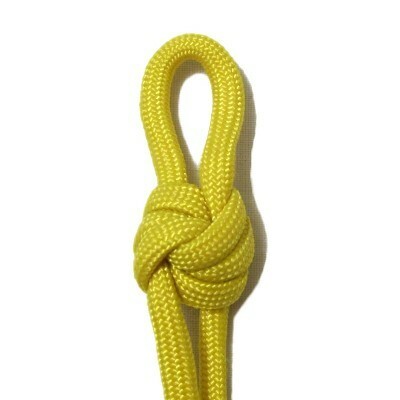 Description: The Clasped Hands knot is an interesting historical knot. It symbolizes two hands resting within each other in friendship and love. It makes a great clasp for jewelry, when made with fine cord materials (1mm - 2mm). 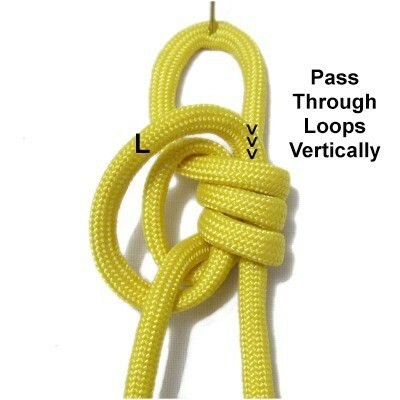 You can also use this technique in Macrame projects where you need a sturdy loop, such as in a plant hanger or curtain. 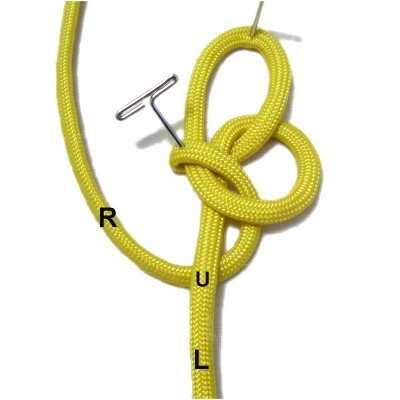 I found this unique knot in Decorative Fusion Knots, written by JD of Tying it All Together. Be sure to visit his website, by clicking on the link or image. 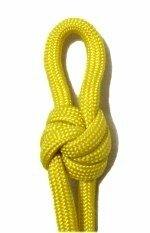 The video gallery contains tutorials for a variety of very unique and appealing knots. Step 1: Fold a 36-inch cord in half and secure it to your board at the center. Use the left half to make a counter-clockwise loop, passing under to make the crossing point. Mentally label it loop 1. 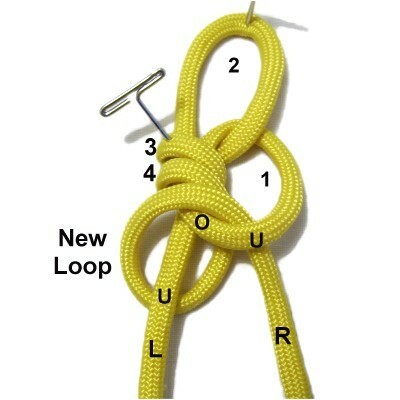 Step 2: Move loop 1 to the right and secure it at the crook. Move the right half of the cord through loop 1, passing it under - over the two segments. 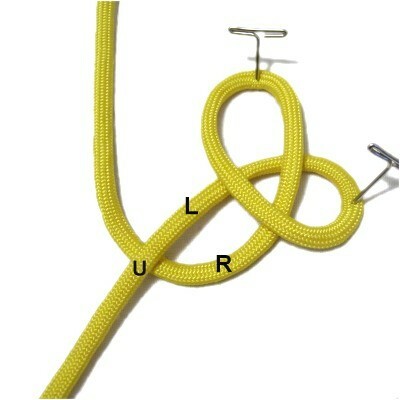 Step 3: Move the right half of the cord under the left half, as you curve it to the left. Step 4: Create the third loop by moving the right half of the cord clockwise, passing over the three segments in the center area. Bring it through loop 1, passing under the segment in front (closest to you). 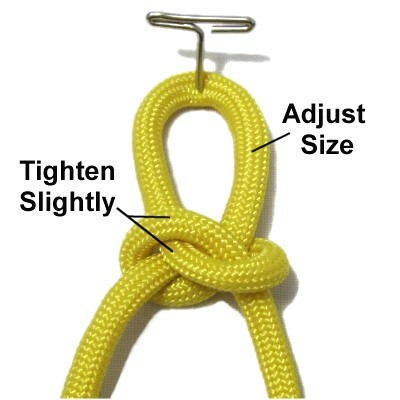 Tighten this portion of the Clasped Hands Knot slightly, by pulling on the ends. Adjust the size of loop 2, so it's close to the size you want to end up with. Tighten loop 3 a bit more, then secure it. 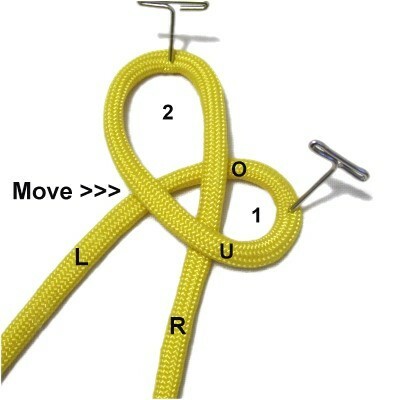 Loosen and enlarge loop 1. Step 5: Move the right half of the cord under the left half, heading left. 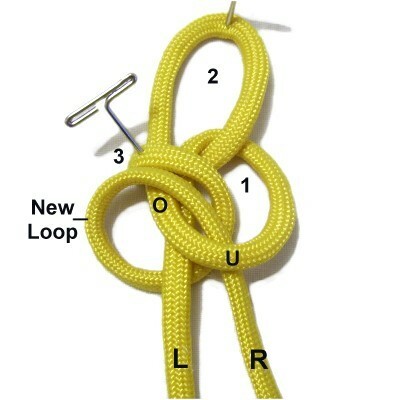 Step 6: Make a new loop (4) by passing the right half of the cord through loop 1 over - under, rotating clockwise. This loop should rest in front of loop 3, which is secured. Step 7: Repeat Steps 5 and 6 to make one more clockwise loop (5). It should rest in front of loops 3 and 4. 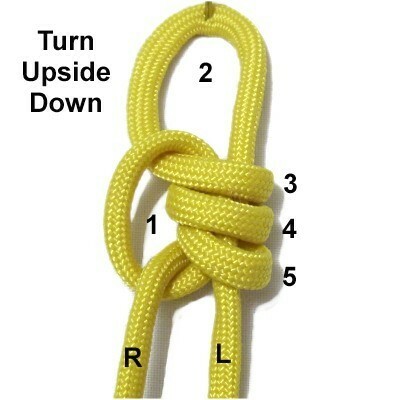 Turn the first half of the Clasped Hands Knot upside down. Mentally label all the loops you have made in the previous steps, as shown in this image. You will use the left half of the cord in the following steps, which is now on the right. Step 8: Pass the left half of the cord under the right half, as you move it to the left. Step 9: Moving clockwise, bring the left half of the cord to the right. 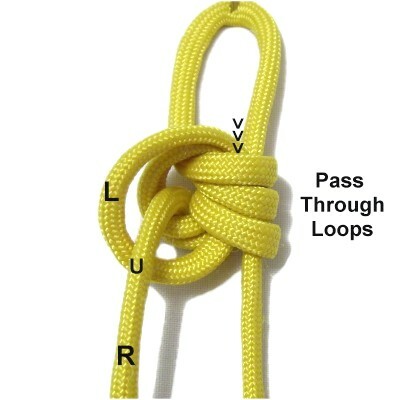 Pass it through all three loops vertically. You may need to use pliers or tweezers. This creates another loop on the left, which should rest in front of loop 1. Step 10: Repeat steps 8 and 9 to make another loop. 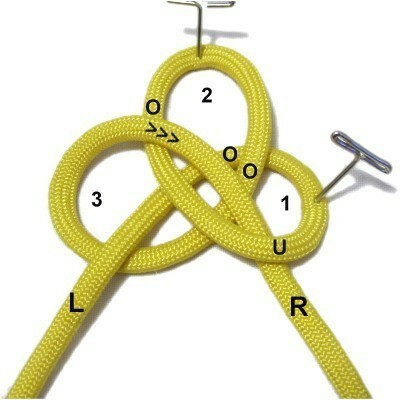 It should rest in front of the two loops on the left side of the knot. 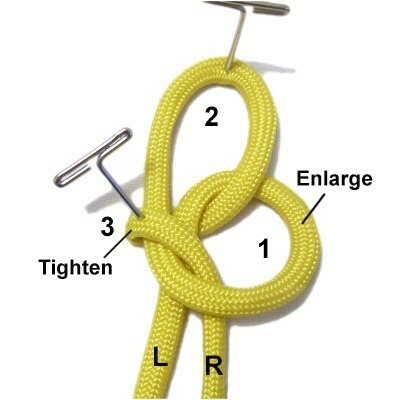 Step 11: Tighten the Clasped Hands Knot by pulling on the ends more than loop 2, so it does not become too large. 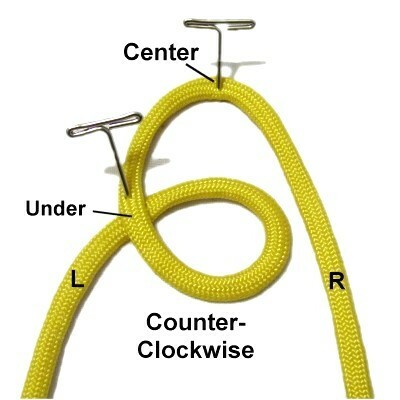 Adjust the coils as needed so the knot looks neat. 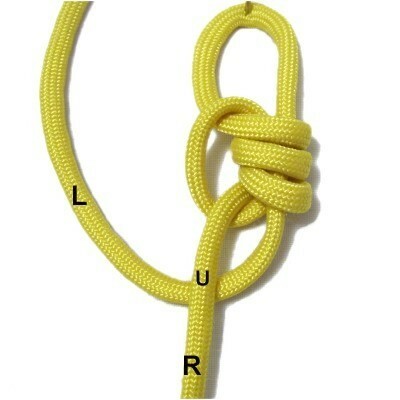 Have any comments about the Clasped Hands Knot? Contact Me.